Allows for removal or adjustment of shelves without disassembling the entire unit. Polymer shelving sections are non-corrosive and feature MICROGARD® antimicrobial proctection. Easy to assemble in minutes”only one person required. Shelf sections are dishwasher-safe. Available in widths of 18" and 23", and in lengths of 36" and 48". 1 1/4" diameter legs are grooved for positive positioning of shelf connectors. Post caps included. 1 1/4" diameter rails. Solid or louvered shelving available. Heavy duty 5" diameter swivel casters with rotary bumper, two with brake. U3-L2336PZM 23" x 36" LIFESTOR® polymer utility cart, EAGLEbrite® zinc finish with louvered shelves. U3-L2348PZM 23" x 48" LIFESTOR® polymer utility cart, EAGLEbrite® zinc finish with louvered shelves. U3-S1836PZM 18" x 36" LIFESTOR® polymer utility cart, EAGLEbrite® zinc finish with solid shelves. U3-S1848PZM 18" x 48" LIFESTOR® polymer utility cart, EAGLEbrite® zinc finish with solid shelves. U3-S2336PZM 23" x 36" LIFESTOR® polymer utility cart, EAGLEbrite® zinc finish with solid shelves. 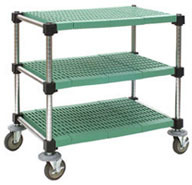 U3-S2348PZM 23" x 48" LIFESTOR® polymer utility cart, EAGLEbrite® zinc finish with solid shelves.